Starting a new business but don’t have sufficient funds to set up a proper office? That doesn’t mean you cannot proceed with your worthwhile business idea. With around 4.34 million people working from home in the United State alone, home offices have become quite popular in the past few years. Home-based offices not only help entrepreneurs reduce the overall operation cost of the business, but also allow them to spend more quality time with their families. However, having a home-based office doesn’t have to reflect lack of professionalism and civility in your working style. Rather, it needs to be even more convincing, that despite working from home you are not leaving a single stone unturned to fulfill the target. In order to boost your company’s bottom-line and attract more potential clients, it is essential to impress your customers with determination and consistency. How do you do that though? Simple; you project your serious attitude towards business matters through the appearance of your office. 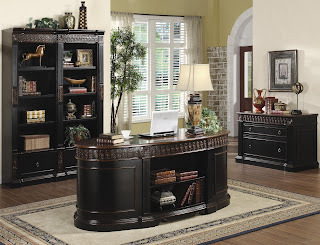 Home office furniture sets can be of substantial help to fulfill this mission. So if you are searching for elegant as well as affordable home office furniture, look no further- Home Cinema Center is the hub for supreme-quality, finely designed, and competitively-priced furniture pieces. In this article, we are going to look at three exclusive home office sets that will glorify your room and elevate your productivity, all without burning a hole in your pocket. 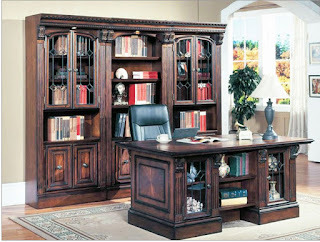 The furniture under Nicolas executive home office sets includes three two-tone finished pieces with detailed carvings. Primarily, it comprises of an oval shaped, 7 drawer desk, a three drawer file cabinet, and a bookshelf with six adjustable and two fixed shelves. However, you can order an additional single bookshelf as well. The second in the list of exclusive home office furniture is the Huntington 4-piece set, which is more likely to have an English Traditional Style. It has been manufactured using sturdy chestnut wood, which has double shading on its surface, making the furniture look classy yet decent. 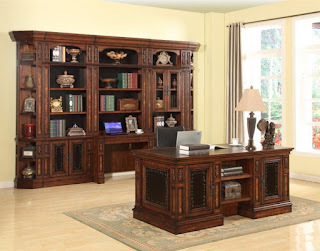 The set includes a double pedestal executive desk with several drawers and shelves, a 32” open to book case, and two 32” glass door bookcases. If you have a corporate-type business where you have lots of files and books for recordkeeping and reference, this is the most appropriate set to keep everything well organized in the office. The last one on the list is the peninsula unit that comprises of 5 basic pieces- 2 peninsula desks, a 32” open top bookcase, and an outside corner bookcase. With accent shadings, magnificent diamond pattern, multi-step chestnut finish, and unique contemporary design, these pieces of furniture are going to transform the look of your office completely and are also going to affect your productivity positively. If you are interested in other such finely designed sets, check out our collection at Home Office Furniture – Home Cinema Center . Amazing collection of home office furniture sets, Which you have shared here. These all are very beautiful and I liked all of these. Easymove App helps you to connect with the local mover that offer on-demand services in Chicago & New York.